Annapolis' Farrah Hall was back on her sail board on Wednesday competing in the Women's RS-X at Weymouth Bay and Portland Harbour. The windsurfer who graduated from Broadneck High School and St. Mary's College finished 18th in both Race 3 and Race 4 of the windsurfing competition on Wednesday. After 4 races, Hall is now in 18th place overall as she moved up 3 spots in the standings with her efforts on Wednesday. She was in 21st after the first day of the regatta on Tuesday. The winds off the coast of Weymouth ranged from 15 knots to 20 knots during the regatta on Wednesday afternoon. The are 26 sailors competing in the Women's RS-X. The next two races will be Thursday. Friday is an off day for Hall and the other windsurfers. 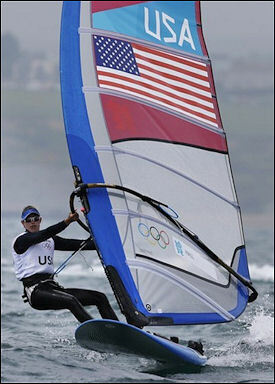 Hall has now sailed in 4 of the 10 windsurfing races ahead of the medal race on Tuesday. Spain's Marina Alabau Neira leads the Women's RS-X after two days of races. Israel's Lee-El Korsiz is second overall. The first-time Olympian from Maryland says she likes the environment where she and her teammates are staying in Weymouth during the sailing regatta. "The boat park is quiet and everyone is getting down to business," said the 30-year-old from Annapolis.